Look out for the romantic view ! The ancient village of Eze is without a doubt a gem in the French Riviera’s crown. This rocky little place, perched on top of a peak, offers a sumptuous view over Saint Jean-Cap Ferrat. It’s where the real appeal of the Côte d’Azur shines through. A stunning place for your love ceremony! Eze is a must see when visiting the French Riviera. Perched on a rocky series of cliffs overlooking the Mediterranean sea, you are sure to get an incredible view of the deep blue sparkling waters from up there. Located between Nice and Monaco (where 2 international airports connect to the USA), it is easy to reach. The scenic ride up in itself is jaw-dropping. Eze, is one of France’s most impressive medieval village. It is a magical, well-preserved and typical small place. If you are looking for great eloping idea, this should be on your list ! Stones houses, winding uneven lanes, the 12th century historical ruins give the village a feeling of historic romance. The magic works in Eze, taking you back to the middle ages period, a great place to feel like a prince and princess and declare your love. Please note that for Eze you need to add + 75 euros of time & transport fee per vendors on your package as they have to travel from Nice to get to Eze. 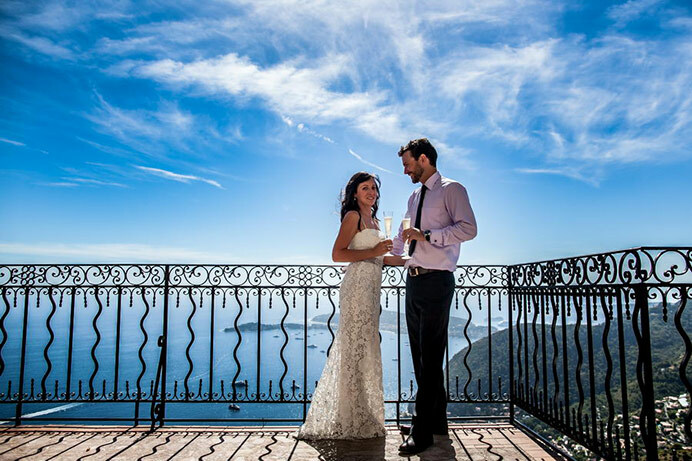 Eze is a small place, where you will be happy to celebrate your wedding vows outdoors! In such a beautiful place, it would be a shame not to make the most of the superb scenery. There are many delightful options to set your wedding ceremony in the village. One of the option we like is the exotic garden. It has spectacular panoramic views, and the garden winds up between sculptures, statues and countless rare species of plants and cacti. There also lies the ruins of the old castle. The French Riviera is a must-see if you’re having a getaway in France, and Eze surely is the most typical southern seaside village you can find there. Eze has been a very popular and much-loved site for our ceremonies since the beginning of our activity. Blessed with a year-round sun and a stunning view, it’s a lovely, romantic place to hold this precious day. What a better place do have a unique blessing? Over the years, we have developed a network of seasoned and caring professionals locally. Wether you’re looking for a hair and make stylist, a car, flowers, a photographer or a video producer, to capture this perfect day, we know where to go to provide you with the “creme de la creme” artists! With over 300 ceremonies celebrated at Love Gracefully, our wedding officiant in Eze is not only an experienced celebrant but a caring person. He is committed to make this day a sweet, flowing and stress-free one for you. Praised by many couples as a friendly and warm officiant, he designs intimate and personalized ceremonies. You can watch here a great testimonials video that will tell you more about him. Happy couples’ own words are the best plaudit we can get! Our priority is to make turn the day you dream of into reality. We hope to meet you soon in Eze to celebrate and toast together to your love!